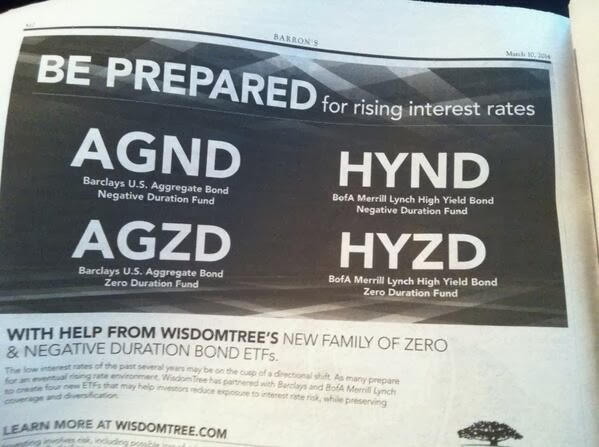 Credit Bubble Stocks: Wisdomtree: "Be Prepared For Rising Interest Rates"
Wisdomtree: "Be Prepared For Rising Interest Rates"
Barbarian Capital posted a Wisdomtree ad from Barron's pitching their new "Be Prepared For Rising Interest Rates" ETFs. What about preparing for falling interest rates?? But, this ad tells you what retail has been convinced is the greater threat. A negative duration bond fund! That means they are short 10 and 30 year government bonds and invested in shorter duration, lower quality corporate bonds to make up yield. Exactly what I've been saying - people are so terrified of rising interest rates that they have substituted credit risk instead. How ya gonna keep 'em in 10 year bonds when they've seen the Wisdomtree BofA Merrill Lynch High Yield Bond Negative Duration Fund? And while we are all bracing for higher interest rates let us also not forget to brace for surging import growth from China! Hahaha! Just need to get past three full years of increasingly awful weather first, of course. Sigh. Thanks Mark, I was hoping you'd see this post. Three years of increasingly bad October weather in California! Oh, yes. Wouldn't miss it, lol. Here is the proof that ZIRP is just about over! This next crash, things will drop like a stone. And then the next recovery, the received lesson will be to own as much oil and highly leveraged real estate and penny stocks as possible. Resulting in a more violent recovery. It's like a rapidly spinning flywheel that has developed an imperfection leading to a weight imbalance and wobble. But, maybe the inflationists are right. Mark, go buy a commodity index fund so you can make money off of the new buildings the Chinese are building. Yes! Exacrtly! A commenter (Rob Dawg) used the tank-slapper analogy, which is just about perfect. Sustained oscillation has two necessary components: An underdamped second order or higher system and a positive feedback mechanism. An example of an underdamped second order system is a spring and mass system where the mass can bob up and down (oscillate) when hanging from a spring. What's our theorized positive feedback mechanism? All the momentum investors? "The restoring force is applied in phase with the progress of the irregularity, and the wheel turns to the other side where the process is repeated." What's our theorized positive feedback mechanism? 1a: The unquestioning belief that recessions cannot happen during ZIRP? 1b: The unquestioning belief that interest rates will rise as our economy continues to recover? Note that I see both unquestioning beliefs as the same belief. I have therefore numbered them as 1a and 1b. Others might see them as two independent beliefs that somehow "unquestioningly" reinforce each other. As we all know, two independent beliefs are twice as strong as just one, lol. Sigh. I think the feedback mechanism is the momentum investors, who are using those rules 1a and 1b as part of their mental model of the world. 1c. Cramer pushing sound effects buttons on Mad Money implying that it is just *that* easy to make money in the markets. Casinos use this same pavlovian conditioning. I visited Reno as a kid. I was amazed how much more upbeat the casinos seemed when they were full compared to when they were nearly empty (different times of the day, with different "winning" sound levels). A recent study conducted by the Centre for Addiction and Mental Health has shown that music plays a major role in ones attitude towards gambling. It has also been found that the music from slot machines as well played an active role in ones gambling. Aside from the colors and graphics on the machine, the sounds as well have the ability to excite and motivate us to continue gambling, for example the slot machines play a different tune when you hit a jackpot or win a free spin and this in itself encourages us to pursue the game in the hope of winning. The researchers agree that gambling is in fact more psychological in nature than we think; therefore music is a powerful tool in the world of gambling.